Great quality, washes well and came out wrinkle free. Vibrant colors are same as shown in the photos. Modern pattern really makes it pop in the room. Well made, very pleased! Enhance any bed or room with the elegant and stylish Reversible Evelyn Quilt Set by Windsor Home. The reversible design with a modern multicolor side and bold contemporary side, allows you to decorate any bedroom to your exact mood at any time and offers you with multiple home options. The soft microfiber material gives you a luxury silky feel that provides a comfortable and restful sleep. I love the bedspread. However, I ordered a king size for my Queen bed because I wanted it to fall close to the floor. The pillow shams of course were too big for my queen pillow, but I just folded over the extra material and they look fine. I purchased this quilt for my daughter mostly because it was cheap and she needed a few changes of quilts due to the dogs sleeping with them. It has held up well considering 2 dogs and two adults are using it and has to be laundered often. We weren't worried so much about the pattern, as we were with durability. This completely worked well for our needs. Love the colors, the pictures do full justice to the actual product. Would definitely recommend to anyone that wants to brighten up a room. Great buy! 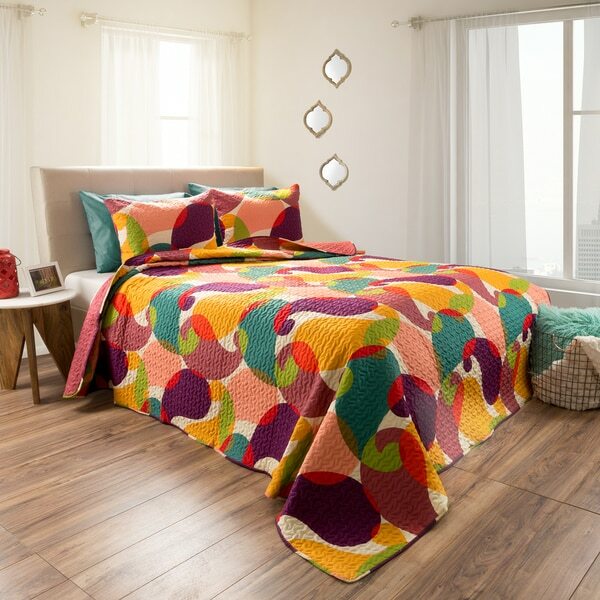 I totally love these quilts! The colors are just like the pictures, very pretty. I ordered 2 for twin beds they are not to heavy just perfect for spring and summer. I ordered this as a gift for my sister. It brightens and compliments the furniture in her room. She really loves it and has started to decorate around this quilt's colors. Seems small for a King Size Quilt. Also really light weight and stiff at first. Will use it for a few months. The colors are BEAUTIFUL!! Very happy I got the king size for my queen size bed . I think the queen would have been a little short. This is a nice enough set, my only reason for not giving it 4-star rating is because the color faded after the first wash - it's still nice, but, less vibrant colors. Recommend for everyday use. Great set for kids room. Lots of vibrant colors. Think cheap motel bedspread....moving past that, the colors are nice but began to fade in areas after 3 washes. Also consider the size you order. I ordered the same size as my bed and it wouldn’t hit the top of the bedskirt much less cover it. Going to return. I thought this was cotton and it's 100% polyester. This is the second one I ordered the first one was a gift but I liked it so much I ordered another for myself. I liked the bright coloration but liked that there isn't an insane pattern to go along with all the colors. washes well and brightens up the room. painted room Mauve and teal. Colors are great! Love this! Love it. Colorful and comfy. "In the photo, the quilt reaches the floor. Is it an oversized quilt? Or did they just put a larger sized one on a smaller bed for the photo? I don't want it to reach the floor." This is a standard size set. We apologize for the confusion with the image. It's a surprise for my daughter. She needs color in her room.